New environmental standards and policy mandates have caused several coal-fired power plants to close down across the U.S. However, there is still support for emissions-heavy coal fuel as it has the cost advantage. The basic idea is that coal is cheap, or at least seems so. This view makes it tough for low-carbon energy alternatives like solar and wind energies to contend. A study conducted by MIT researchers revealed that the economic advantage coal currently enjoys may soon decrease. Graduate students Joel Jean, David C. Borrelli, and Tony Wu showcased this idea through their working paper for the MIT Energy Initiative. The paper illustrates that using solar and wind photovoltaic generation facilities instead of current coal-fired power plants could offer advantages for the environment and for bottom lines sooner than excepted. To prove their point, the team developed an online tool called CoalMap, a web application designed to compare the levelized cost of electricity (LCOE) of current U.S. coal-fired plants with the anticipated LCOE of probable new utility-scale wind and solar generation in the same areas. LCOE is the lowest electricity price a power plant has to achieve to manage investment costs over its lifecycle. The tool gathers its data from publicly available data sets from portals, such as the National Renewable Energy Laboratory and the U.S. Energy Information Administration. 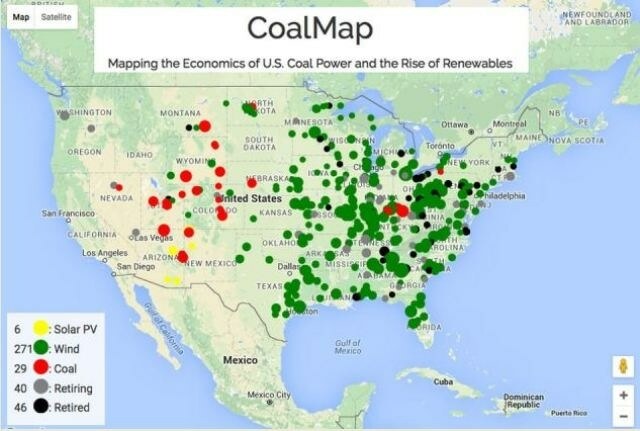 CoalMap is a map of the continental U.S displaying locations of current coal plants, with markers representing nameplate, capacity and relative cost of each plant. As users apply various carbon prices, rates of cost decline for solar and wind, and operation subsidies, they can examine the effects of these alterations on the cost-competitiveness of renewable energy throughout the country. The outcomes may surprise those defending coal’s natural cheapness. If levelized costs continue to drop as wind and solar technology progresses, both will draw alongside coal with regards to cost-competitiveness in the years to come. The effect will be much more surprising if a carbon price is executed. As the authors elaborate, “imposing a price on carbon would make new solar and wind facilities significantly more competitive with coal power, even without major cost reductions” due to technological development. The researchers state that if carbon cost rate coupled with progress in clean energy technology occur, almost all American aging coal-fired plants may have to shut down within the next 20 years, replaced by inexpensive low-carbon energy generation, even without subsidies and in areas with meager wind and solar resource. The design for the CoalMap was conceptualized during the MIT Clean Earth Hackathon conducted by the Department of Civil and Environmental Engineering and the MIT Office of Sustainability in 2015. At the event, the team comprising Wu and Jean, both of the Department of Electrical Engineering and Computer Science; Borrelli, an alumnus of the Department of Chemical Engineering; and Fanni Fan, an MIT Sloan School of Management MFin student, won in the energy category, rising to the Rocky Mountain Institute’s challenge for hackathon contestants to construct a compelling map with the ability to assist policymakers and regulators to take action against unprofitable or seriously polluting coal plants. Everyone on our team was very interested in the scalability of renewable energy, especially solar, so we decided to take on the challenge. Apart from academics and activists, Jean and his colleagues hope that stakeholders and policymakers will also make use of CoalMap. They wish to make the data provided by the map available to the public, especially people who can influence change on issues of climate and energy. CoalMap has an easy to use interface, and can draw people’s attention to economic and environmental costs of long-term operation of legacy coal plants in the U.S., and at the same time underscoring the advantages of investing in clean energy production. It’s incredible to see, how fast solar and wind costs have dropped and how soon they can become competitive with even the cheapest legacy coal if historical rates of cost decline are maintained. Jean highlights the fact that CoalMap makes use of a single metric, which is levelized cost of electricity in $/kWh, and that coal plants can operate constantly, autonomous of time of day, while solar and wind are irregular generation sources, making direct comparison between the two technologies difficult. The Clean Earth Hackathon sponsors offered support that initiated the project. Francis O’Sullivan, director of research and analysis at the MIT Energy Initiative, and John Parsons, executive director of the Center for Energy and Environmental Policy Research, provided feedback on the working paper prepared by the team.